A cursory glance at the above table would lend one to believe that Cork were much the better team – their Shot Rate was on a par with Kerry’s; their Success Rate was above Kerry’s whilst their weighting was as good as you’ll find. Lies, damned lies and statistics eh? Cork’s problems stemmed from the fact that they did not get enough attacking ball. Their Shot Rate may have been very similar to Kerry’s but that still produced 7 less shots. The very high weighting shows that the shots they did take were of a generally higher tariff but they just did not get enough of them. As a comparison in the three games against Kerry in 2010 & 2012 (see here) Cork had an average of 37.67 possessions and 30.33 shots. In a tight game, as these games generally are, not having those 5 extra shots proved decisive. Kerry’s game plan was excellent. 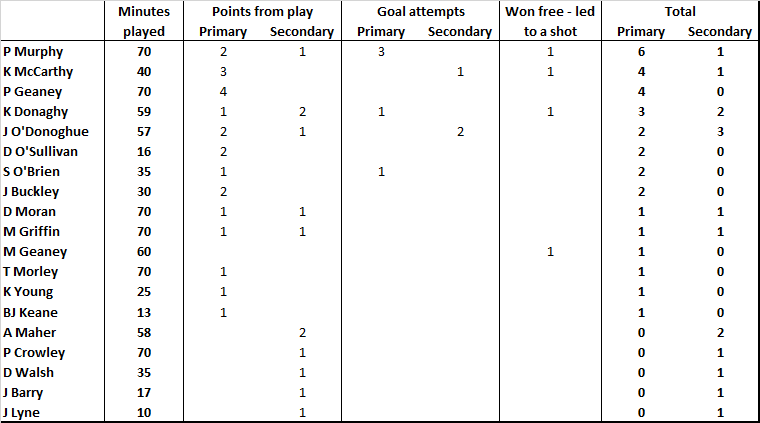 In the first half they took 12 shots from inside 25m scoring 1-07; by comparison Cork scored 0-02 from 3 shots within 25m. Kerry’s Success Rate was bang on average because their second half returns dropped whilst their long range shooting (from play) was poor overall. Kerry only had a Success Rate of 13% (1 from 8) from shots taken from play outside c35m. In the three games referenced above Kerry averaged 24 shots. Just as Cork found it hard to overcome the 5 shots they dropped they equally could not afford to allow Kerry to have an extra 9 shots. Cork were very poor shooting from play early on. They only converted 36% (4 from 11) until the 54th minute with 4 of those 7 misses not having any Kerry pressure on the shot. After that they hit 86% (6 from 7) with Hurley’s saved goal shot in injury time being the only miss. As stated above Kerry were very good at moving the ball in close for a shot in the first half and though they were racking up scores the relative ease of the shots meant that their weighting wasn’t dramatic. Indeed the shooting was so poor out the field that their Success Rate, at bang on the average of 42%, was less than those in the three previous games – 44% & 45% in the two 2010 games plus 45% in 2012. This is an area that Kerry have struggled in to date ( see here) but it was a tower of strength for them in this game with Sheehan & Kealy converting two enormous frees. Goulding had a magnificent day from the ground with his only miss coming from past the 45m way out on the right. His returns place him squarely on top of the deadball charts. What is the strategic thought process when that ball goes wide? Try for a draw (through 3 points or a goal) or go for a win with a point & a goal? If you are going for a draw through three points you cannot take 58 seconds from the wide to the ball going over the bar. Even if you get the score quickly you need four things to happen – win possession, score from shot, win possession & score from shot. By going for a point here the process cannot be going for a win surely? You cannot rationally expect to score a goal on the next kickout – it is possible but as a strategic option? The only option Goulding had here was to drop the ball in and get a goal chance from the 45m directly or from the next attack should Kerry defend that. By going for the point the logic was either flawed by going for a win or the execution in a very, very (too?) small timeframe was too slow. Again a bit of a surprising return however like the shooting this was a game of two halves. Kerry won possession on 56% (15 of 27) of the kickouts in the first half whereas Cork won 68% (17 of 25) in te second. 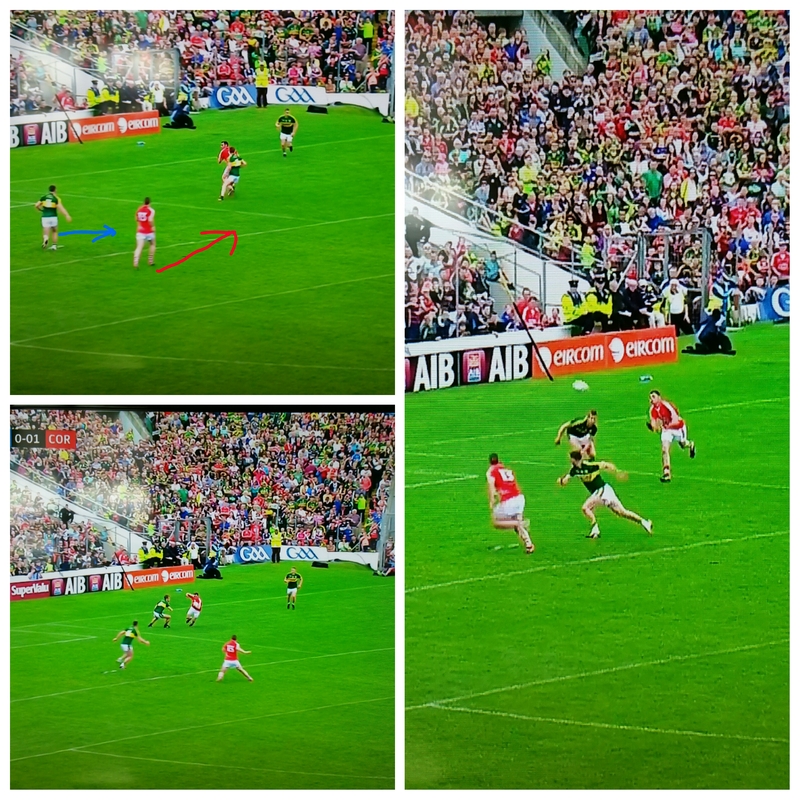 What Kerry were excellent at was moving the ball into an attacking position from the primary possession they won. They won possession from kickouts on five fewer occasions than Cork yet managed to get the ball into the Cork’s 45 on two more occasions. One thing to note is that Kerry didn’t really use the short kickout. 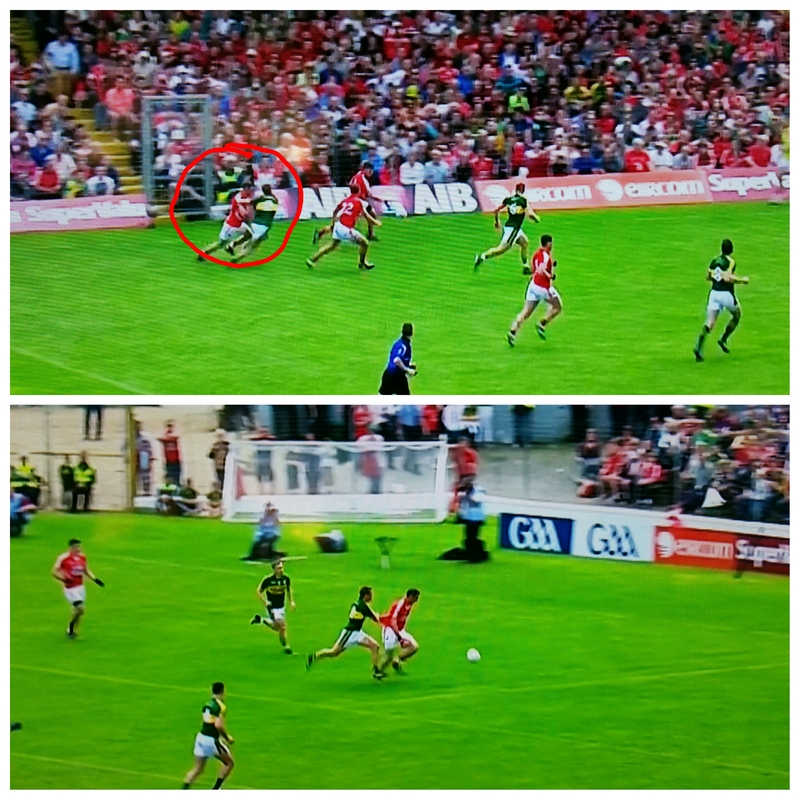 The one time they did try it the ball went over the sideline and gave Cork good field position. It is a almost a requirement for defenders to get up the field and shoot, as evidenced by T O’Sé and Loughrey taking 6 shots between them however I’m sure O’Sé will be working on his finishing in the coming weeks! A slight change in format for this game. Uniquely I have three Cork-Kerry games charted (both Munster SFC games in 2010 & Sunday’s game) so we can make direct comparisons with how the teams performed then and now. Firstly we’ll focus on Kerry and whether they are in such a state of decline that Joe Brolly felt comfortable enough to liken them to Fermanagh. There are a few things that immediately jump out. 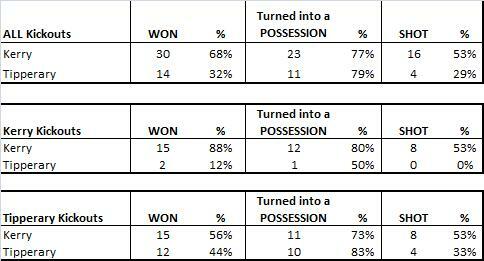 Firstly the number of possessions that Kerry had are very, very similar across the three matches. Have Kerry changed *that* much? Or is it that the outcome of the most recent game changes our perception of how games are played? If Kerry have suddenly slowed down the speed at which they deliver the ball into the forwards then you would expect a bigger volume of possessions in the two 2010 games. It isn’t there. And what of the fact that they were able to get more shots off on Sunday than in both games in 2010? Does that not point to a management team who knew what worked in 2010 (they were inseparable from that year’s champions over 140 minutes) but refined what they were doing to get more shots off? The bare numbers do not support the ‘terminal decline’ arguement. What let Kerry down wasn’t their style of play, for this produced more shots from a very similar level of possession this time around, but rather their execution. Their success rate was way down on what they achieved in both 2010 games and it wasn’t because they were taking harder shots. An expected return of -2.06 from Sunday shows that they simply should have converted more of the chances they had. Again Kerry’s returns from play were very similar; again they got more points from play on Sunday because they had more possessions. As an aside those shooting returns are basically a sea of mediocrity – with the forwards that Kerry possess you would expect their class to rise at some stage. Without any empirical evidence I’m willing to give the Cork defenders a lot of credit for ‘caging’ that Kerry attack. What let Kerry down badly on Sunday was their deadballs. Could it be that the huge malaise at the heart of the Kerry team could be as simple as missing Bryan Sheehan? 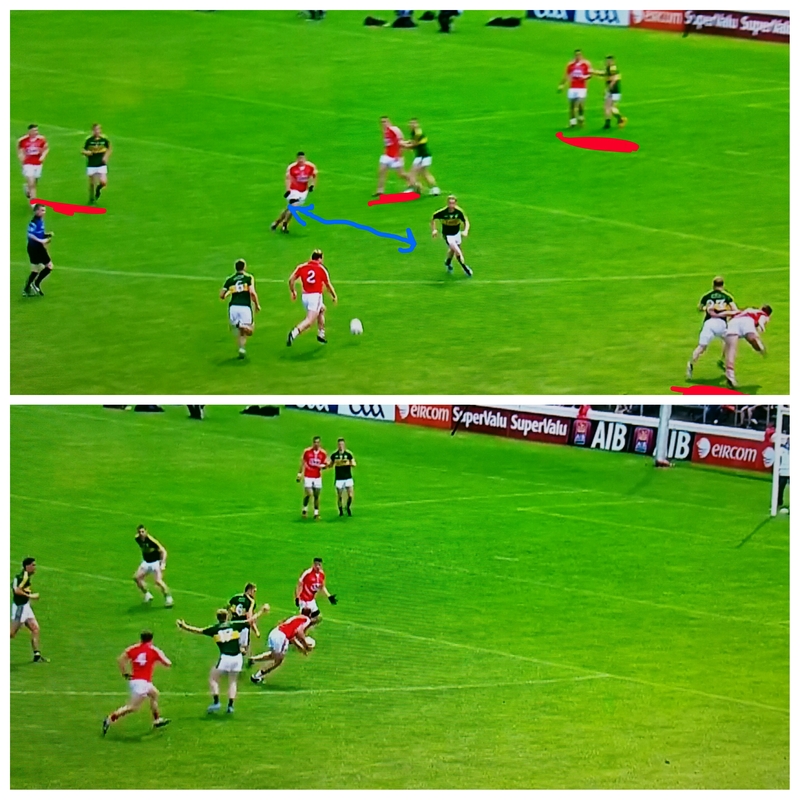 Kealy missed two central 45s whilst Galvin also had a bad miss … you would have to expect Sheehan to get 2 of those 3. If he did that would make it 0-15 to 0-14 with 5 minutes to go. Would this Kerry team’s obituaries be so quickly written?? There is another side to this story which is how Cork performed – they can be extremely happy with their first outing. Cork had a lot more possessions and shots than Kerry in all three games. The difference was that on Sunday the Cork forwards converted a greater percentage of the shots. The success rate for shots from play for the 4 games in 2010 was 44%, 45%, 44% & 40% – little or no difference. This time around Kerry maintained their end of the bargain – 45% – but Cork upped their performance to 55%. Is this due to an old, tired Kerry falling off challenges and letting Cork have easier shots? Of the 22 shots from play that Cork had I charted 68% (15 shots) of these coming from players under pressure; in 2010 the equivalent numbers were 60% and 50%. I am much more inclined to put Cork’s improved shooting performance down to the Cork forwards than to anything Kerry did or didn’t do. The three games are more or less the same with two vital differences leading to Sunday’s result; Kerry’s deadball accuracy went awry and the Cork forwards’ shooting from play stepped up a notch. I fear that the Kerry obituaries currently being written are forced and we’re missing the truth staring straight at us – the Cork machine is ticking along nicely.